Frost signals the end of the growing season, but if you take a few simple steps, it doesn’t have to mean the end of your gardening. When a light frost threatens—one in which the temperatures dip just below 32 degrees for a short period of time—you can take a few measures to protect your favorite plants for a while longer. 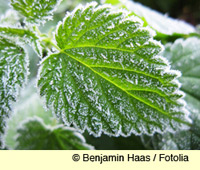 A hard frost, also called a killing frost, is when temperatures get below 28 degrees for several hours. This type of frost kills all annuals, even those that will tolerate a light frost. Also, there’s little you can do to protect annuals from a hard frost. • Cover plants, as much as is practical, with sheets, light blankets, or any other non-plastic cover. (Plastic tends to trap cold and is less good for protection.) Anchor ends with bricks or stones as needed to prevent blowing. • Bring indoors any pots you can carry to enjoy a little longer. The types of flowers that do well outside in pots usually don’t do well in the limited light indoors. After a few weeks, they’ll start to get sickly, but for a while longer, you can enjoy their color and scent. • A few types of plants in pots can indeed survive all winter. Hibiscus, jasmine, rosemary, citrus trees, and others will often survive the winter if given plenty of light and humidity. • Some people like to overwinter their annual geraniums to enjoy again in spring. Click here to see various methods Iowa State horticulture extension recommends. • Leave peppers, squash, and most other vegetables. They can take a light frost. In fact, some vegetables, such as brussels sprouts, actually taste better after a frost. • Cut all basil. Pinch off any flowers and put the cut ends in a jar of water. Cover with a plastic bag and store in the fridge. Or make pesto. Or simply puree the basil leaves with olive oil and freeze in ice cube trays to use in soups and other dishes through the winter. • Parsley and cilantro are fine with just a light frost. But they won’t last much longer after that. Cut them and store as you would with basil. • If you have any houseplants still out, bring them in. Even if they’re in a covered area, most don’t like cool temperatures. Rinse them off with a gentle spray of water from the hose or the shower to make sure you don’t bring in any bugs. • Check out our list of cool-season and warm-season annuals. Cool-season annuals will tolerate a little frost; warm-season annuals are killed by frost. • We have a nifty Fall Clean-Up List to help you make sure you get it all done in time! • Need tips on how to plant fall bulbs for spring bloom. Click here! • Keep track of frost yourself! The National Weather Service has a handy-dandy web page of various weather alerts, including frost.